The notable retail furniture brand, Godrej Interio launched a social media campaign named Upload and Transform on August 2, 2013, which acts as a sequel to the previous one with the same name held last year. 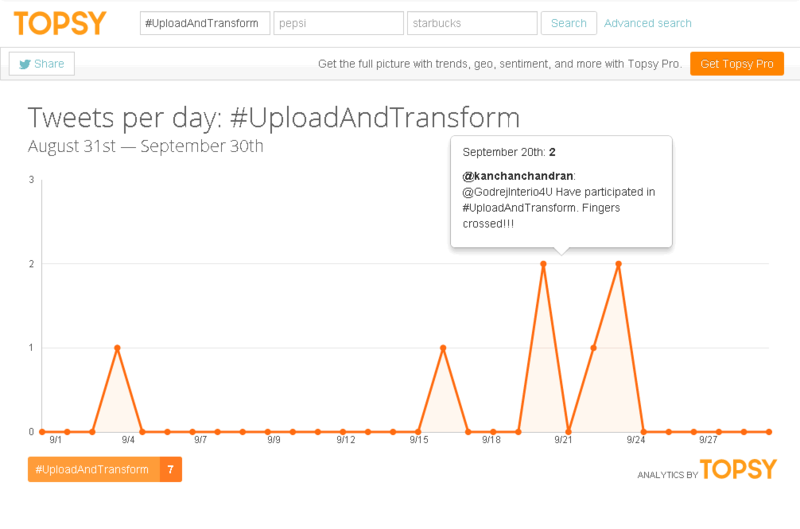 The campaign is extensive and leverages three different social media platforms, namely YouTube, Facebook and Twitter. 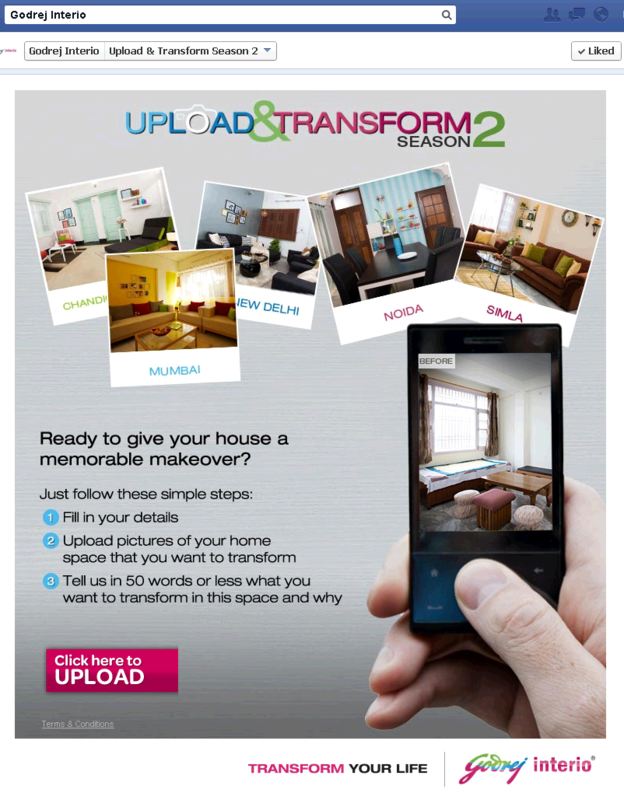 The campaign requires users to upload a picture of their home, specifically the area which they want to transform. The campaign is still active and will end on 31st October, 2013. The campaign tries to engage with users and provide them an offline experience that strengthens their positioning as a brand that transforms people’s lives. The campaign has been executed with the help of a Facebook app which asks users to ‘like’ the page before participating. After users have liked the page, the Facebook app explains the various steps for enrolling in the contest. The app then navigates the participant to the registration page and the users are asked to fill in personal information with a picture of their home. Uploading the picture should be followed by an explanation of 50 words describing the place that needs to be transformed and why. 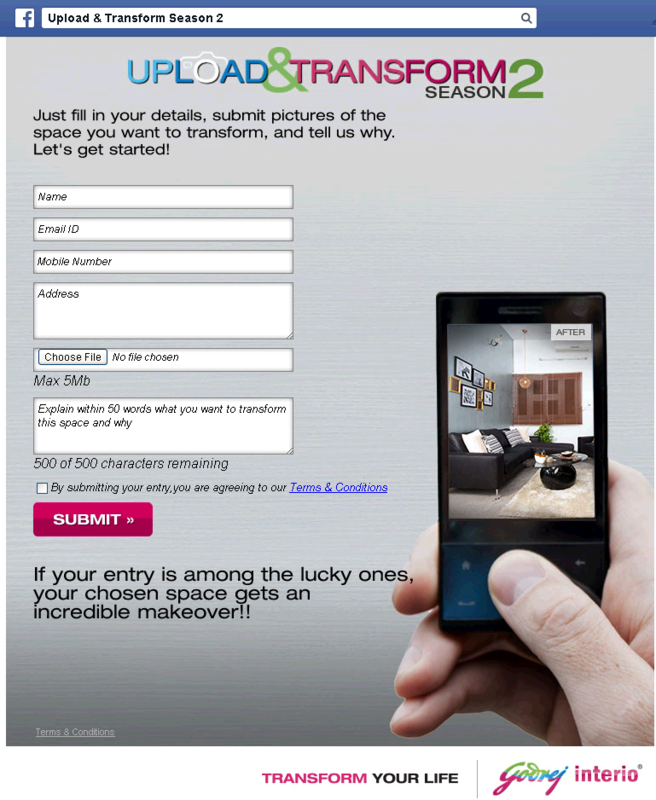 Only pictures of the living room, bedroom or dining room are considered as valid entries for the contest. In this edition of Upload and Transform, the brand is giving away 25 prizes, out of which 3 winners have already been declared. A video announcing the winners was created, and it described the diverse steps they had to go through before renovating the winners’ homes. The contest asks the fans to ‘Like’ the page in order to participate, which has helped the brand to build a user base. The use of content focused pictures are lively and draws the user’s attention. The beginning of the campaign started with a reminder of the older campaign in the previous year, which was effective in connecting with the fans. It had a good recall value and motivated them to participate. The YouTube Channel has been effectively used. The videos shared are of good quality and are very focused to content. In fact, sharing the process of transforming the house is a great way of showing your expertise and value proposition. The social media approach of Godrej Interio is remarkably well thought out, and there is also a lot of user interaction. However, they lack consistency in their posts. The irregularity in their posts is quite visible on both Facebook and Twitter. A little bit of push, with regard to marketing, could have worked effectively for them. But they clubbed this contest with other ongoing campaigns, which diluted the interest. Godrej Interio has an amazing social media presence and they also seem to understand social media well. The approach is good, however, one activity at a time would concentrate their energies better.